The last couple of months Nike have launched two new Nike Mercurial Vapor IX boots, which draw inspiration from Mercurial boots, worn in previous World Cups. The two we have already seen are from France in 1998 and Japan & Korea in 2002. 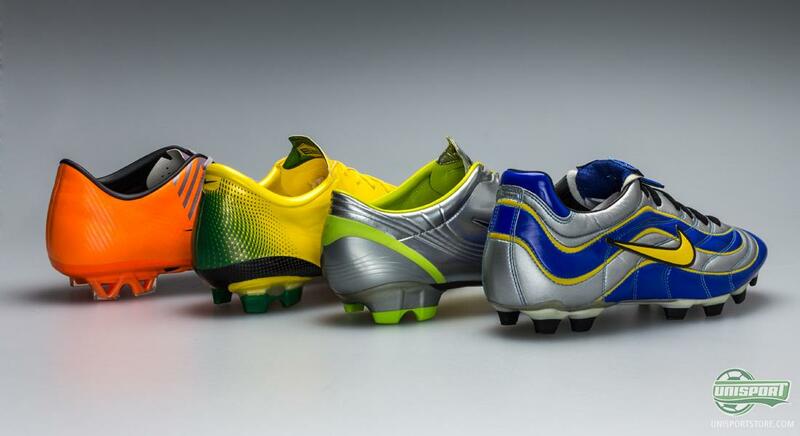 We take a closer look at the originals, as well as look at the Mercurial boots from last two World Cups. The World Cup in Brazil is not far off and we are buzzing with excitement. Nike are by the looks of things just as eager and have been warming up for the World Cup, with their Fast Forward-collection. 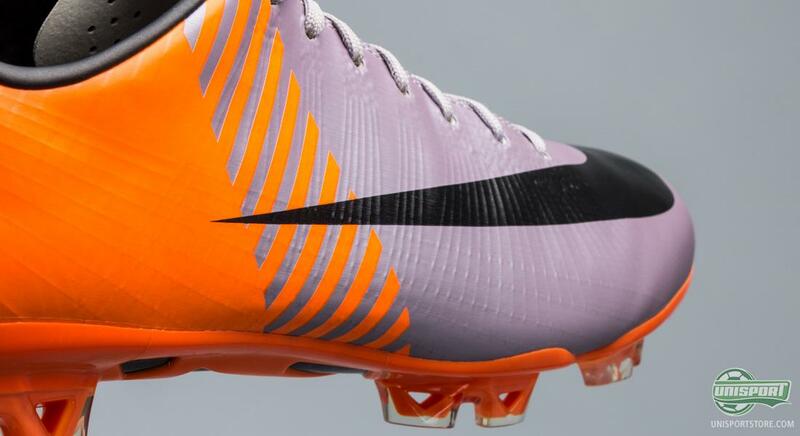 It is the super modern Mercurial Vapor IX that celebrates the design and colours from the original Mercurial boots. 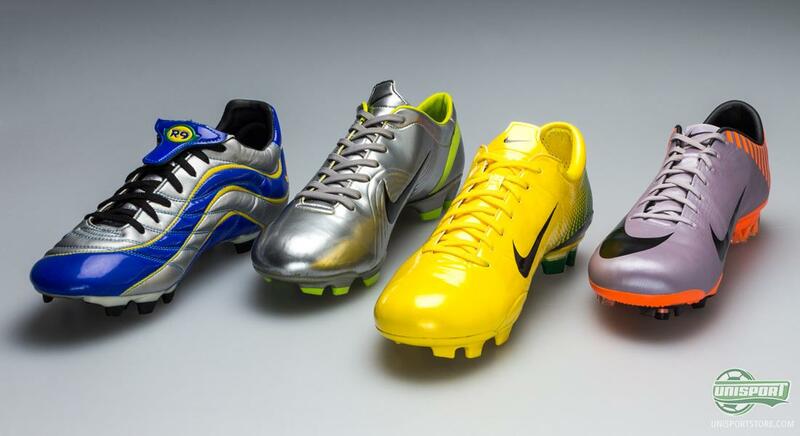 We have already seen the Mercurial R9 from 1998 and the Mercurial Vapor I Chrome/Lime from 2002 – and the question is, whether Nike will continue the trend and have more up their sleeve for us? 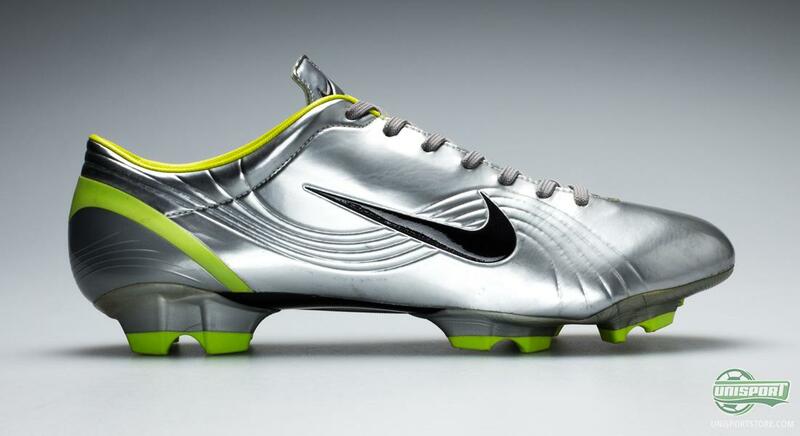 The big Mercurial adventure started in 1998, when Ronaldo, at the World Cup in France, laced up his very own colourway of the Nike Mercurial I. 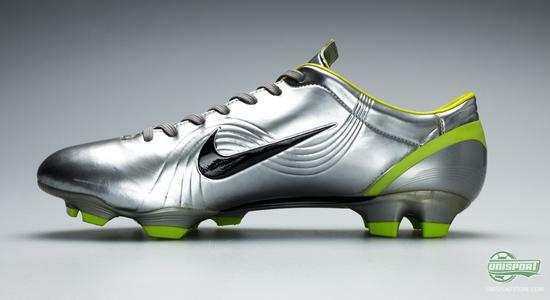 It was Nike’s very first boot made entirely from a synthetic material, so it was in many ways groundbreaking. 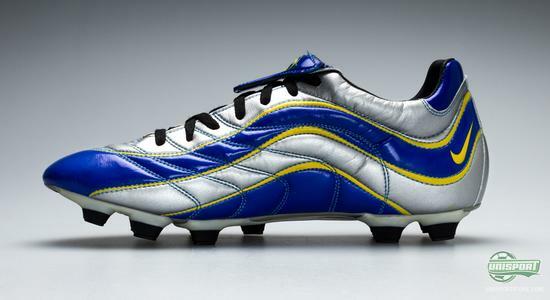 The boot was introduced in 1998, back when it was still considered strange, when a boot wasn’t black and white. This is how R9 helped to establish the market for colourful boots, which we today see everywhere. Do you want to celebrate the very first Mercurial football boot? 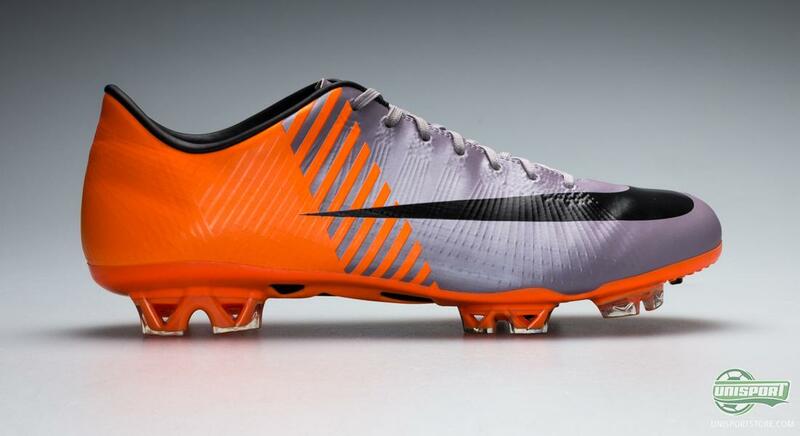 Then the Nike Mercurial Vapor IX Neo Lime/Metallic Silver/Polarized Blue – Just €209. Today a speed boot weighing 250 grams, would be a joke, but in the nineties it was by a mile the lightest boot ever made. It was therefore only fitting that Nike chose to give the boot to the worlds, at the time, most lethal striker in an exclusive colourway. The first Mercurial was made from Nike’s synthetic KNG-100, which is both lighter and stronger than kangaroo leather, - while still emulating the great qualities of the leather from the bouncy animal from Down Under. The expectations resting on Ronaldo and the rest of the Seleção, were enormous, as they went into the World cup tournament in 1998. For a long time the defending champions looked to live up to those expectations, but in the final France proved too much. The game finished 3-0 and to this day there is still much mystery surrounding the fitness of Ronaldo, who started the game, despite obviously being very poorly. Four years later the World Cup circus moved to Asia for the very first time. Japan and South Korea hosted the grand event, with Ronaldo, Rivaldo and Ronaldinho combining into one of the most feared attacking trios ever. It was however R9 who stole the show – and particularly in the semi-final and final he showed the World what he could do, by scoring 3 goals in in the last two games, while wearing his Nike Mercurial Vapor I Chrome/Lime. 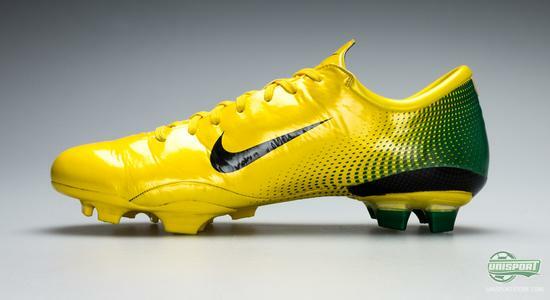 Ronaldo’s unique Vapor I was made especially for the Nike athlete at the tournament, who performed the very best. With R9 outshining stars like Thierry Henry and Totti, the choice naturally fell on him. The football boot is inspired by a sprinters shoe, to give the very best acceleration and allow for lightning quick changes of direction. It is made with an upper of NikeSKIN, which was carved in one single piece for an even upper. The Vapor I was also the first boot to break the magic 200 gram mark; with it weighing just 196 grams. Do you remember Ronaldo’s magic World Cup in Japan and Korea? 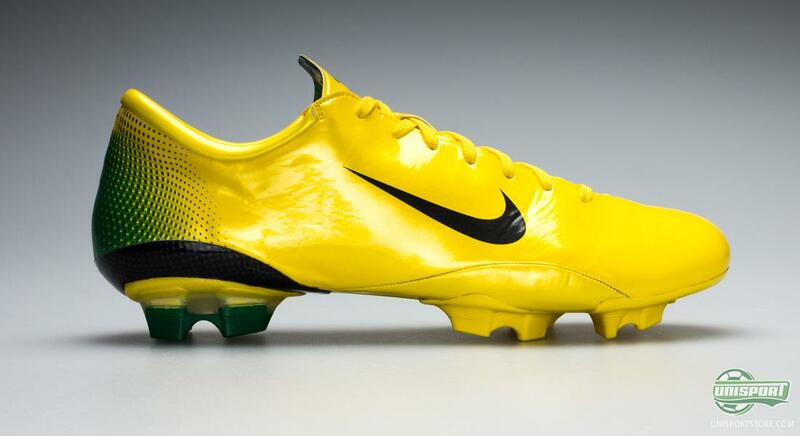 You can honour his performance with the Mercurial Vapor IX Metallic Silver/Volt here – just €206. That it was Ronaldo who had the privilege of wearing this exclusive Chrome/Lime boot was, as mentioned, not decided going into the World Cup. Nike had decided to have their top athletes earn the boot. The message seemed to come across to R9, who showed inspired form and won the right to wear the boots. 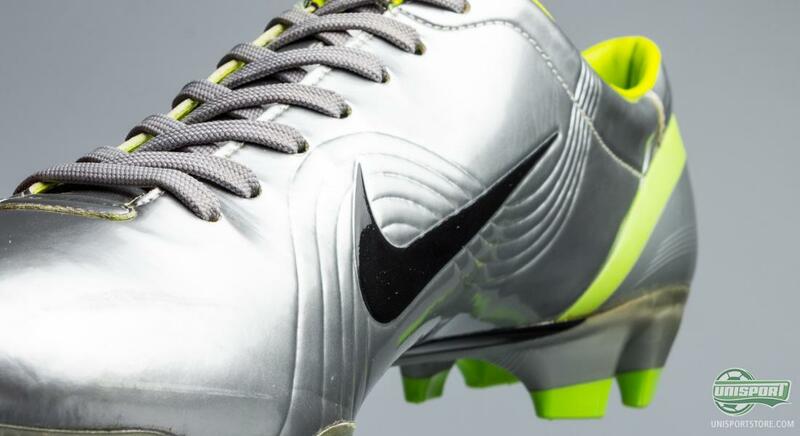 He also used the Chrome boots to devastating effect in the semi-final and final, scoring 3 goals over the two games. Push things forward four more years and it’s time for yet another World Cup and yet another boot. In 2006 we found ourselves in Germany and as reigning World Champions the expectations were once more sky-high for Brazil. Ronaldo had a pair of special Nike Mercurial Vapor III ready for the occasion, in the Brazilian colours; yellow and green. 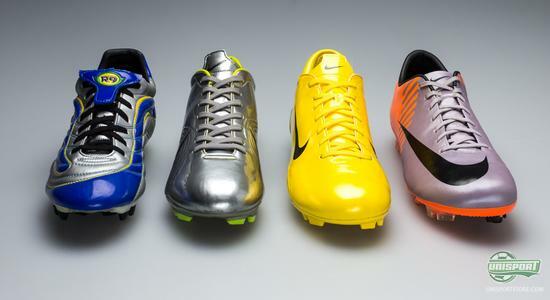 Nike really put in great effort, when improving on the previous versions of the Nike Mercurial Vapor. 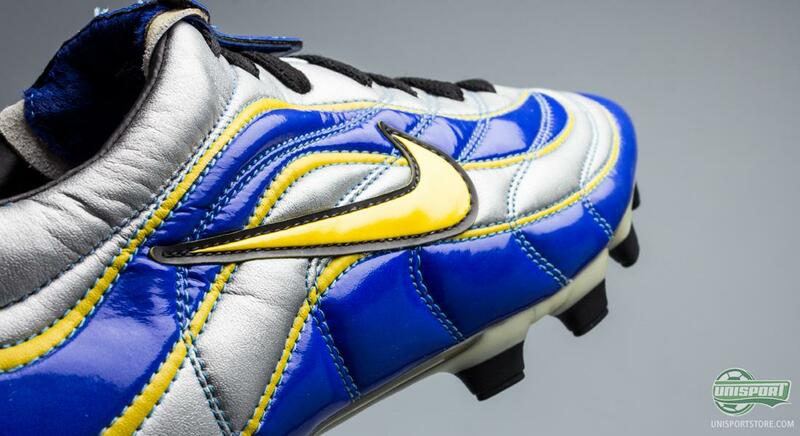 It wasn’t easy, but with a new Japanese synthetic from Teijin, as well as a new outsole, Nike managed to make one of the most popular boots ever made. Still weighing an impressive 196 grams and with a tight and precise feel. Ronaldo had yet another successful World cup in his unique Nike Mercurial Vapor III. The Brazilians stormed through the group stages, winning all three games. On the 27th of June, the fans at the FIFA WM Stadion in Dortmund witnessed a piece of football history, when Ronaldo scored against Ghana. It was Ronaldo’s 15.(!) goal at a World Cup Tournament, meaning he beat Gerd Müller as the most scoring player in World Cup history. It was however Ronaldo’ last World Cup goal, as Brazil crashed out again, with France once more besting them. Fast forward to the World Cup in 2010 and unfortunately R9 was out of the picture, - but there was a new Ronaldo ready to take over. Cristiano Ronaldo had the pleasure of playing with the Nike Mercurial Vapor Superfly II from the Elite Series-pack, where all the boots shared the same design. 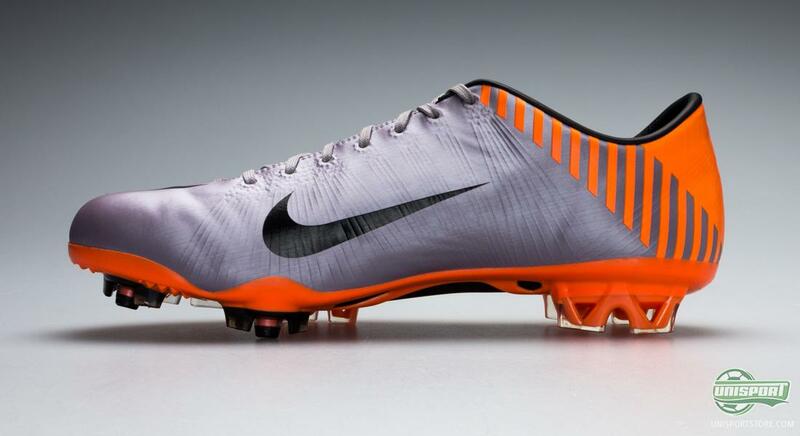 Already at the European Championship in 2008, Nike had experimented with a similar design and at the World Cup in South Africa they showed off an eye-catching combination of silver and orange. The Nike Mercurial Vapor Superfly II football boot introduced the NikeSENSE stud-configuration, which brought with it great advantages, when it comes to sudden changes of direction. The Superfly II boot also had the significant Flywire-technology, known from running shoes. All this technology did mean that the football boot gained some weight. At 240 grams the Nike Mercurial Vapor Superfly II was in a very different weight class. Nike were however quick to explain that speed is as much about grip, as it is about weight. That a Vapor today weighs in at well below 200 grams is what that is. 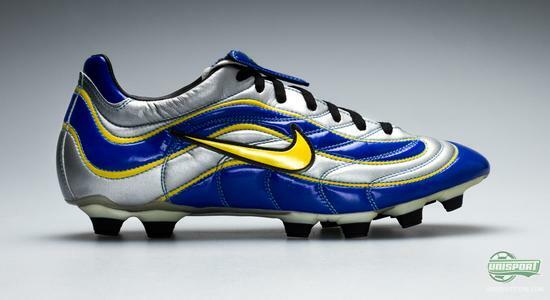 Nike have already celebrated the first two Mercurial boots from the World Cup in 1998 and 2002, with the Nike FF98 and FF02. We have made a campaign-site for each of the two boots, which shows off the Fast Forward collection. You can find the site right here. 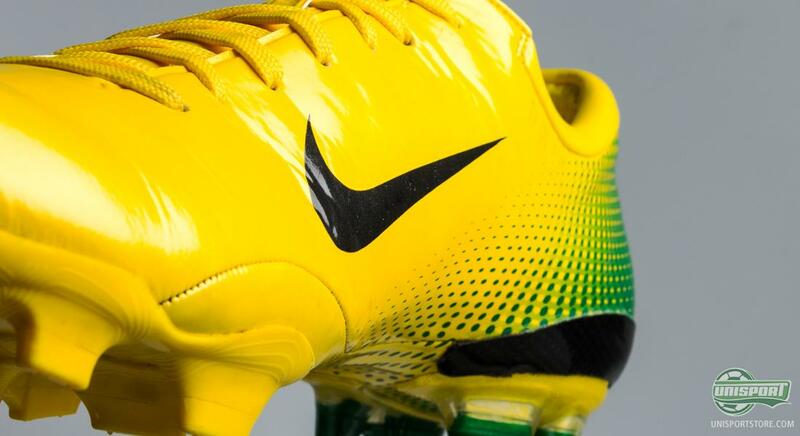 In other words Nike are known for bringing out ekstra special Mercurial boots around the World Cup – and the question is, what will we see this summer? Do you think Nike have an ace up their sleeves? Tell us what you think in the comment-section down below, or on Facebook and Twitter.